Hideous Mangleus formed in March of 1989. After a few line-up changes within the first couple months, they finalized the roster, which consisted of Sam Biles - Vocals, (Jason) Feev(ey) - Guitars, Joel "Skum" Bonde - Bass and Curt Bonde - Drums. About a year later they recorded their first demo entitled "All Your Friends Are Dead," which, with the help of friends like Chaotic Plague and Deceased among others, started to circulate through the worldwide underground. Xeroxed Covers and regular cassettes. Two covers were made. This is the first cover. THIS DEMO WAS NEVER RELEASED. First version. Early attempt at a cover. THIS WAS NEVER DISTRIBUTED! Final and Official Version. Covers were copied on a (Black and white) copy machine; and then hand colored by Sam, he was the artist for the band. The tone varied sometimes due to the various markers used; but the tone in this scan is representative of what the demo cover looked like when colored in. The first 25 tapes had a sticker of their logo (which were on pro grade tapes). The rest were usually Maxell Normal Bias tapes, 90 minutes and did not have any kind of sticker. 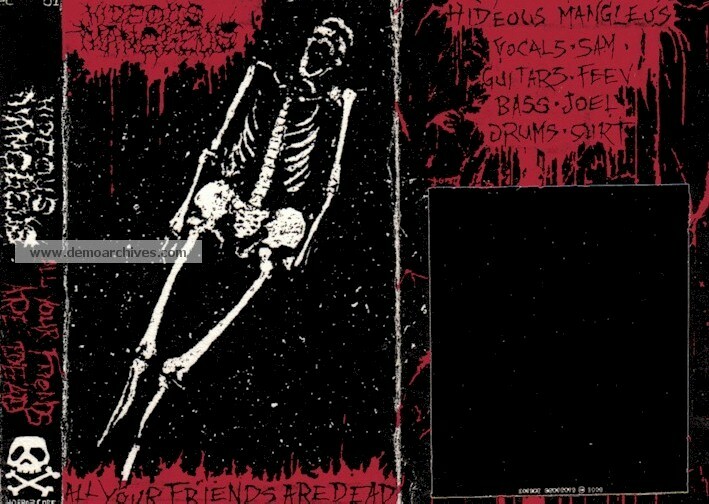 The regular tapes had "Hideous Mangleus-All Your friends are Dead" '90 demo" handwritten by the band. Lyrics were included on the back but this side was not colored.